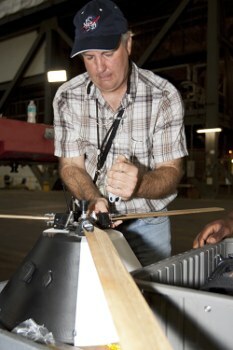 A team of researchers recently brought a pair of scale-model space capsules to the Vehicle Assembly Building (VAB) at NASA's Kennedy Space Center in Florida to try out a rotor system that could be used in place of parachutes on returning spacecraft. The design would give a capsule the stability and control of a helicopter, but would not be powered. 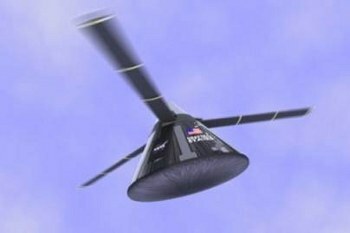 Instead, the wind passing over the rotors as the capsule descends would make the blades turn, a process called auto-rotation that has been proven repeatedly on helicopters but never tried on spacecraft. "The purpose of the testing we're doing here is to study how to get the rotor starting to spin," said Jeff Hagen, an engineer at Johnson Space Center in Houston. "We're trying to build as much of that story as we can." With team members spread out at different levels of the VAB, Jim Meehan stood at the 16th level of the cavernous VAB, about halfway up to where the 2-lb model capsule hung on a line 480 ft above the concrete floor. Holding a helicopter radio-control unit, he remotely changed the rotors' pitch and slowed the fall four times as the unpowered craft landed on a stack of foam. "It's like running four separate tests in one drop," said Meehan, an engineer at Marshall Space Flight Center in Huntsville, AL. The intent is to give real spacecraft a soft landing with enough control that they could touch down anywhere in the world, whether it be a runway or the top of a building. In other words, wherever a helicopter could land, a spacecraft could land, too. "You can land gently, and you can land where you want. You don't have to land out in the ocean," Meehan said. "Compared to a parachute, you get a soft landing, and you get a targeted landing." The rotor concept also fits nicely with spent rocket boosters, Hagen said. Instead of throwing away the stage and its valuable engines, rotors could be built into the booster frame and unfurled as the stage descends to Earth. Just as with the capsule, the stage would be controllable the whole way down and would land softly to save the all-important engines. One might think the blades would fold up like an umbrella on a windy day the moment they touch the airstream around the capsule, but Hagen said the airflow around the hinges would be balanced, so the blades would hold strong. The researchers note that their work is about incorporating different elements together into something that is innovative. "A hundred years ago, there were cameras and there were phones and there were wireless devices to send Morse code and they were all separate technologies on their own," said Les Boatright, an engineer at Kennedy. "Now you have a telephone that does all three of those things and it's a merger of technology. Well, this is taking the capsule entry technology and helicopter rotor technology and merging those in an innovative way to make something that didn't exist before out of two things that did exist before." The development team also notes that some bombs have fins that flick open safely at high speed. The returning spacecraft could use a mechanism similar to the fins, with the difference being that the capsule's blades would start spinning almost immediately after opening. Control fins would open on the side of the capsule, too, to keep it from revolving with the blades. 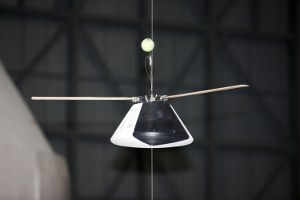 According to the engineers, the testing is extremely simple compared to the high-tech evaluations that must be done before such an experimental system could be flown into space, but the analysis is critical to moving through the early phases of development to convince people it's an idea worth pursuing. The idea is not all that new. In fact, NASA researched the concept for the Apollo capsules but opted for the parachute return for the sake of shortening development time during the moon race. Testing of the concept will get more demanding over time, including the possibility of hauling a roto-capsule miles into the sky on a high-altitude balloon for release. And before rotors are entrusted with the lives of astronauts, designers expect to try them out on a small capsule returning fragile science samples from the International Space Station. For that task, which at this point cannot be done by another spacecraft since the retirement of the space shuttle, the roto-capsule could find a successful niche pretty quickly, researchers said. "That's kind of a big leap from something that's a small test article to something that's on a manned system, but in between you could have something that's a small-scale sample return that's cargo only," Hagen said.